Low back pain is extremely common in the U.S., with millions of adults suffering from it each year. In fact, it’s the leading cause of job-related disability. 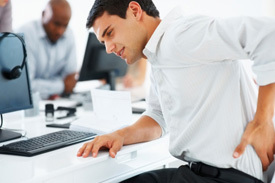 Lower back pain in Geneva may resolve within a matter of days or weeks, or it may become a chronic problem. In either case, a chiropractor can help. During your appointment with the chiropractor, it’s important to describe the type and severity of back pain you’re experiencing. Your specific symptoms will depend on the cause of your lower back pain. If you’ve suffered a sprain or strain of the soft tissues of your back, you’re likely to tell your chiropractor that you’ve experienced the abrupt or gradual development of pain that can grow worse when you make certain movements. A back sprain or strain is an acute injury, which means that you’re likely to experience the most severe pain within the first two to three days of sustaining the injury. Thereafter, your pain is likely to begin diminishing. In addition to lower back pain, you might experience muscle stiffness, spasms, or cramping. Sometimes, lower back pain is the result of a more serious condition such as nerve impingement. This means that a nerve has become compressed, which may occur if you have a herniated disc. Your chiropractor may diagnose you with nerve-related problems if you suffer from pain that begins in the lower back, extends through the buttock, and travels down the leg. This type of pain is referred to as sciatica because it stems from the compression of the sciatic nerve . In addition to discomfort, you may experience numbness, weakness, or tingling down one or both legs. If you suffer from these symptoms in both legs and lose bowel or bladder control, you could have cauda equina syndrome—a medical emergency that requires immediate care at the ER. Many people visit a chiropractor because they suffer from osteoarthritis of the spine. Osteoarthritis is a common form of arthritis that typically begins gradually and progressively grows worse over time. Back pain from osteoarthritis is typically worse when you first wake up or when you’ve been inactive for a long time.